Simple, tiny, and a very good place for other reptiles to bask: Sutcliffe's headstone. I recently lost a foster bearded dragon Sutcliffe to metabolic bone disease. He was such a magnificent creature and I wanted to acknowledge his brief but spectacular existence. Mourning animals is a personal thing. Its been called "disenfranchised grief" because many people feel like they can't mourn the loss publicly. Studies suggest that this sort of disenfranchised grief occurs on cases of perinatal loss, and up to half of animal owners feel that grief is not really accepted by society. And I admit, grief is not an easy subject to discuss, particularly with people who aren't animal lovers - probably for fear of judgement. But that is exactly why I think it needs to be discussed. I've always relied on photographs to remember my pets, but a friend suggested that I order a headstone. To be honest I wasn’t sure how I felt about that, but I did it, and it now sits in the garden. I walked outside the other day and found a skink sunbathing on the stone, which was perfect [well, almost perfect: I didn't have a camera to capture the moment]. 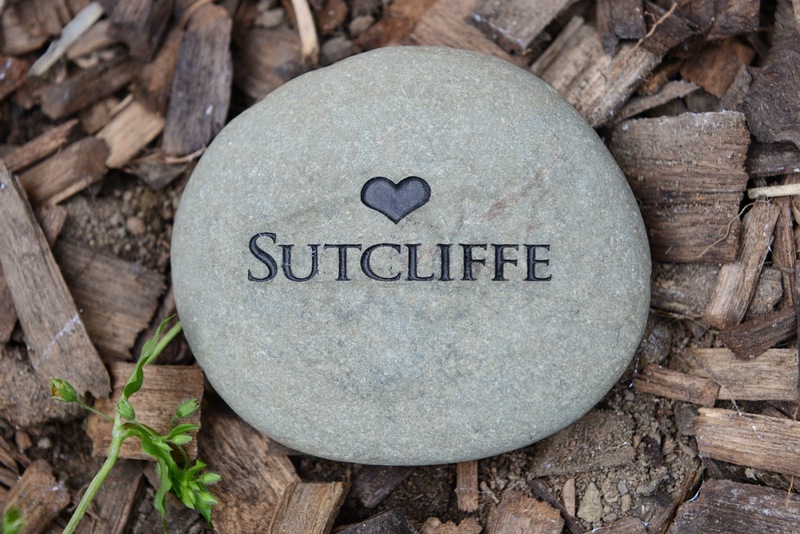 In the process of ordering Sutcliffe’s stone I got chatting with the team from TalkingStones who agreed to answer a few questions about what they actually do. Talking Stones are stone engravers. Talking Stones was “born” when the owners (James and Samantha Rae) lost their own dog, Lady, and they struggled to find a fitting, elegant tribute that didn’t make their garden look like a cemetery. 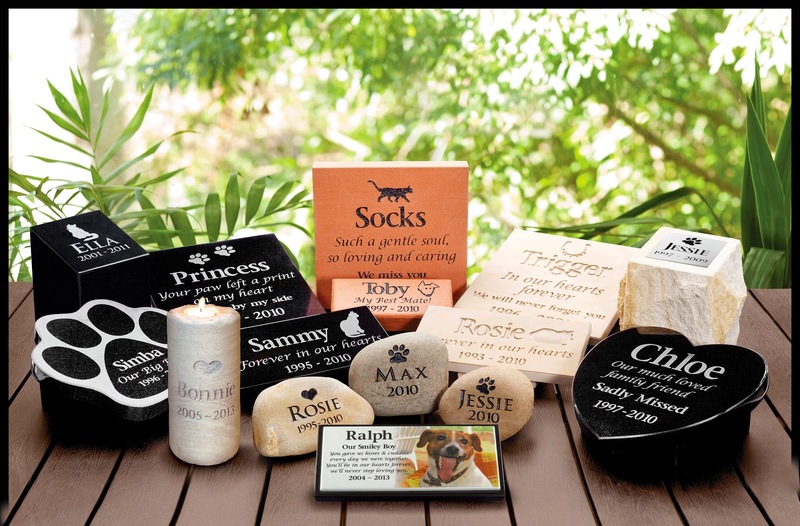 We create a range of high quality, personalised products which include people memorials, house name plaques, wedding bonbonerie and customised, one-off jobs, as well as our core range of pet memorials. Everything we make is lovingly hand-engraved on the Central Coast of NSW and shipped Australia-wide (and sometimes even further afield). We work with a range of materials including tumbled riverstones, granite, sandstone, clay pavers, glass and stainless steel. What species have you been asked to make memorials for? The majority of our pet memorials are for dogs, cats, horses and rabbits. But we’ve also created tributes for guinea-pigs, mice, budgies, cockatiels, bearded dragons, other lizards, snakes, and a duck! What is the largest stone you have made for a pet? 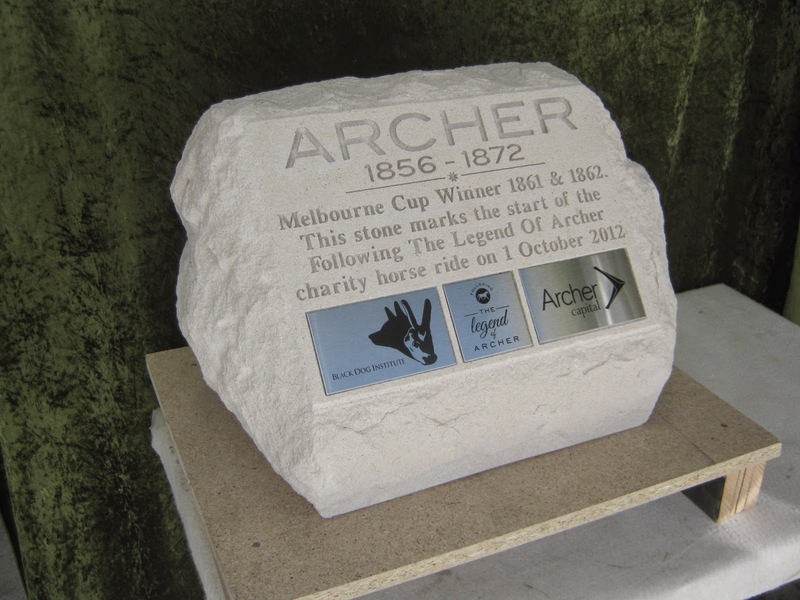 A couple of years ago we were involved in a charity project “Following the Legend ofArcher” where Australian Olympian Ed Fernon rode his horse over 1100 kms from Braidwood, NSW to Melbourne (following the alleged route that Archer took before going on to win the inaugural Melbourne Cup race in 1861). We created a stunning sandstone marker (measuring around 45x35x25cm and weighing approximately 50kgs!). As well as traditional engraving, we also incorporated some very detailed custom engraving on recessed stainless steel plaques. This was placed at the beginning of the trek, forever memorialising the Legend of Archer. We are also involved with creating an ongoing memorial for service animals in the police service and armed forces for the Queensland Government. Most of our business is done through our website or through our network of vet clinics and pet stores, but one day last year a lady knocked at the door of our workshop with two children in tow. The daughter’s pet guinea pig has just died and she was very upset. She wanted something that she could carry in her pocket or school bag. We ended up engraving a tiny tumbled riverstone about 4cm in diameter, that the girl hand-picked from our collection. We pride ourselves on being able to create exactly what our customers have in mind, and have replicated logos and even hand-drawings and hand-writing into stone. Our most recent unusual job was a granite paw-shaped plaque engraved with the Japanese symbol for the pet’s name “Zen”. Does the extent of grief people feel for their pets ever surprise you? In short, no! We are pet lovers ourselves and have huge empathy for our customers – we understand what a gaping hole the death of a beloved family member can leave. We often deal with customers who are very traumatised, and whilst we are always professional and efficient, it’s sometimes hard for us not to get upset ourselves! Interestingly it’s the people with the toughest exterior that really get upset. For example builders and trades people can be devastated when their four legged workmate passes away. Thank you for your time, guys. Its really interesting to hear another perspective on mourning animals. I am currently working on a project about grief and pets at the moment, but vets encounter grief and loss regularly. I'm really interested to learn how others mourn their pets.